Sizes to 4X in their Full Cut Costumes section. 27th year in the hat business and recipient of Hat Retailer of the Year Award. They have serious hats too. Use code "TETE20" for 20% off your order. 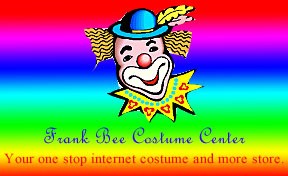 This site has quite a few plus size costumes (and hundreds for regular sizes and kids). They also have a large assortment of costume items available which are not related to size such as masks, make-up, wigs, hats, props, etc. Plus adorable pet costumes. This site is dedicated to plus size costumes only. Sizes to 5X. Plus size costumes and big tall costumes.